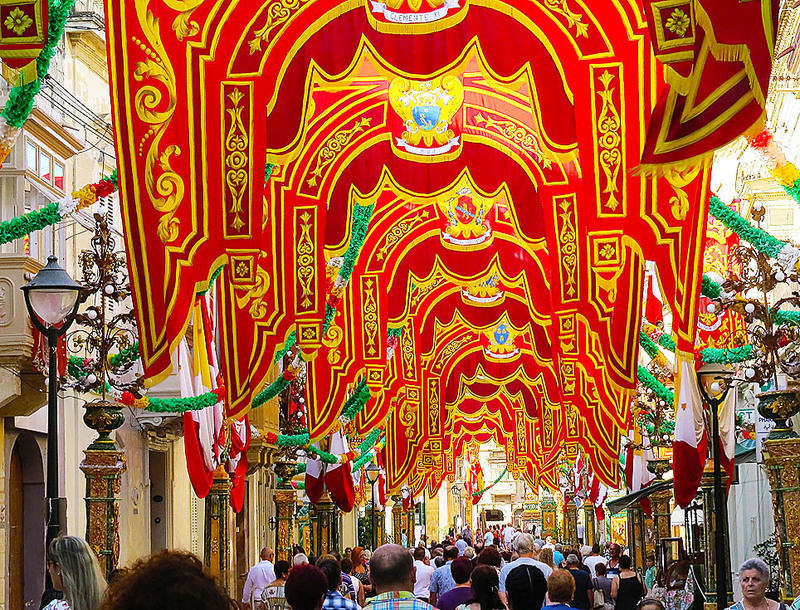 The Maltese festa’s climax is naturally the religious procession in which the statue of the town’s patron saint is carried round the streets, accompanied by bands and feted with confetti thrown by parishioners from every available window, balcony or rooftop along the route. This takes place in the evening on the last day of festivities. Except that they do it differently in Birkirkara. 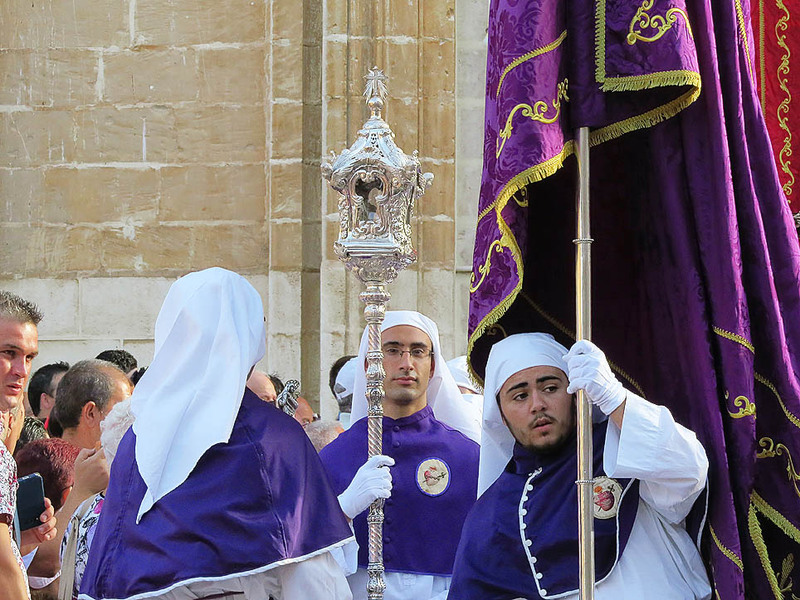 The parish of Saint Helen’s in Birkirkara is the only one in the Maltese islands that holds a morning procession and the pomp and colour of this pageantry befits this ancient and historic quarter of Malta’s largest town. The parish of Saint Helen’s is one of Malta’s ten oldest parishes, set up in1436. The church we see today is the fourth building on the site, superseding three previous churches built on the same spot. It is a magnificent baroque statement and was built between 1727 and 1745 by Domenico Cachia. The church contains numerous works of art and also boasts Malta’s largest bell, commissioned in the early years of the 20th century. This large building overlooks a small triangular square featuring fine low-rise urban buildings, which further emphasise the church’s impressive size. The procession with the statue of Saint Helen starts moving promptly out of the church at 8am but it is recommended that one makes his way earlier to the town to savour the atmosphere and the lavish decorations in the streets – Main Street in particular is probably one of the best dressed urban streets at festa time. Curiously the piazza in front of the church remains practically deserted up to a half hour before the procession. The reason is simple – the devout and the festa aficionados are in church for the High Mass preceding the procession. Then the large bells start tolling –signifying that the Saint is about to start her yearly promenade around town. Magically the square starts to fill up with people spewing out of the church and the nearby streets and alleys and it is soon packed to the gills. 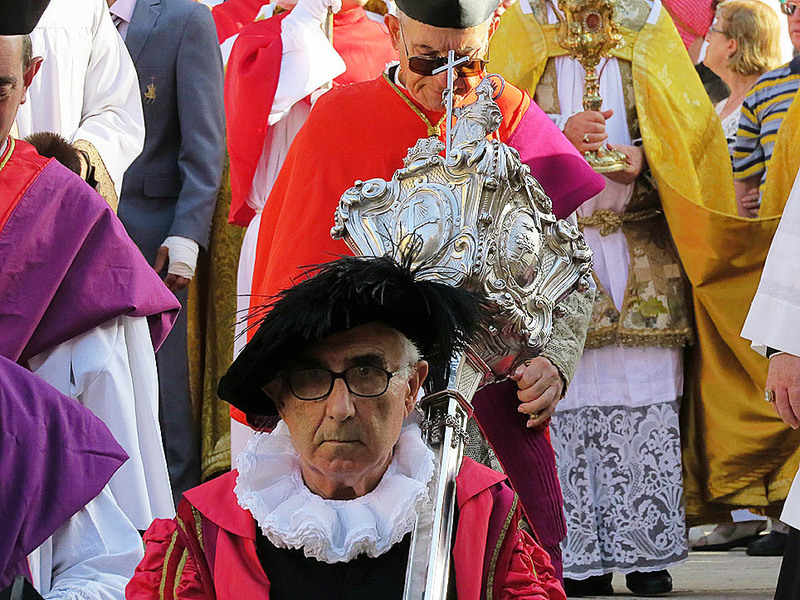 The band strikes up, the church’s giant doorway is thrown open and a colourful succession of members of various church confraternities and smartly dressed monsignori start marching out with their brightly coloured robes, candelabra and banners. 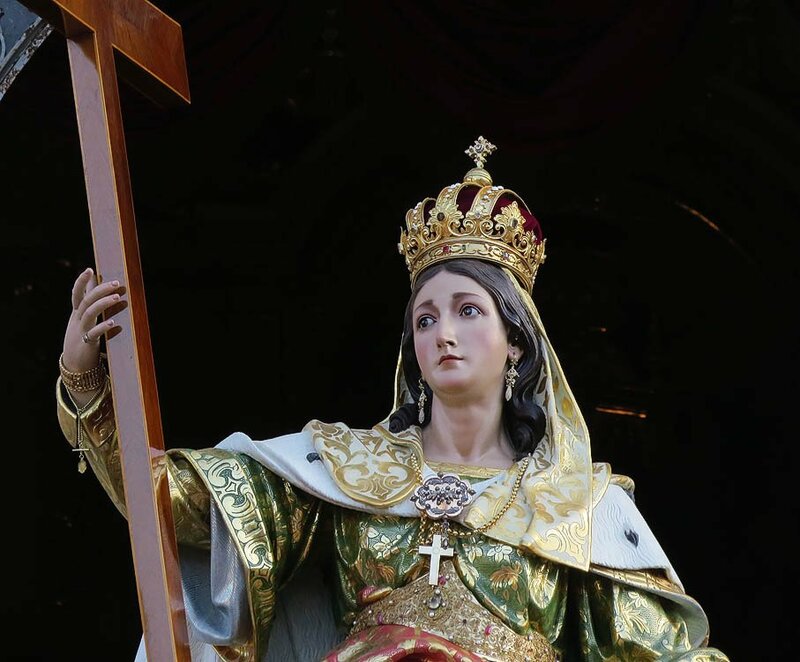 It is an impressive and dignified sight and there is a real sense of history as the church’s red and yellow baldachin appears on the steps of the church – the sign that the statue is finally on its way. Huge applause naturally welcomes Saint Helen’s appearance – traditionally she is claimed to be the Emperor Constantine’s mother and therefore a huge influence (on her son especially) in the early days of Christianity. 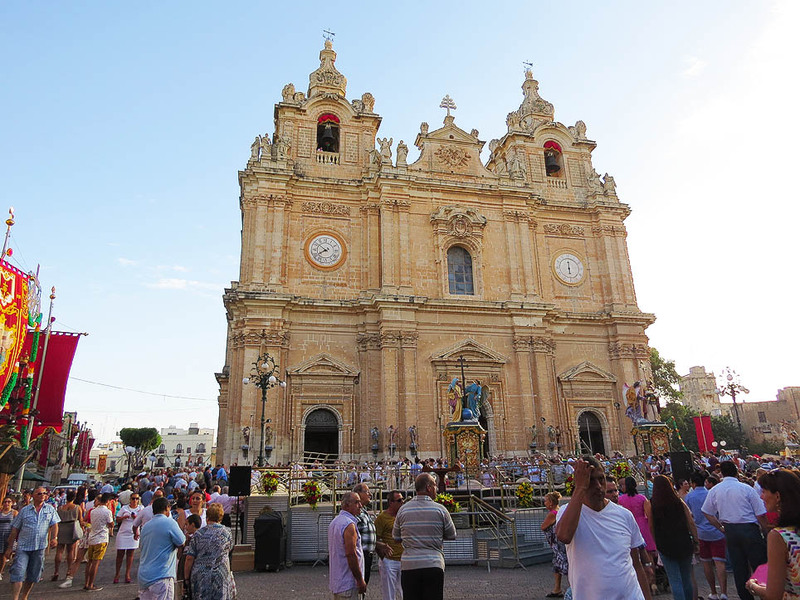 The feast of St. Helen’s in Birkirkara will this year be celebrated on the 23rd August.